Sawubona . . . Visit the storymaking steps, transmedia digital tools, and the featured StoryKeeper’s Gallery designed to inspire and jump start beginners. Consider hosting customize Workshops, Artist-in-Residence Programs or DigiTales Storytelling Camps. These one-of-a-kind artistic learning adventures are meant to lift the spirits, spark creativity and imaginations while deepening content and technical skills as digital authors experience the process of merging the ancient art of oral storytelling with a palette of transmedia tools. Bernajean’s learning environments are joyfully designed and paced to enable participants to master skills, processes and the craftsmanship now needed in creating ALL kinds of exemplar multi-media products beyond storytelling. 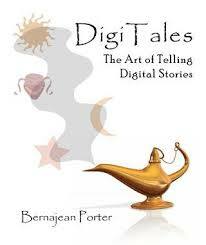 Bernajean’s enchanting book shares the history, craft and detailed steps to become a Digitales StoryKeeper – Learn the artful mixing of narrative voiceovers, sound, images, memorabilia, music and special effects into an enduring personal digital story.